ESA’s Herschel Space Observatory has studied the dusty belt around the nearby star Fomalhaut. The dust appears to be coming from collisions that destroy up to thousands of icy comets every day. Fomalhaut is a young star, just a few hundred million years old, and twice as massive as the Sun. Its dust belt was discovered in the 1980s by the IRAS satellite, but Herschel’s new images of the belt show it in much more detail at far-infrared wavelengths than ever before. Bram Acke, at the University of Leuven in Belgium, and colleagues analysed the Herschel observations and found the dust temperatures in the belt to be between –230 and –170ºC. However, because Fomalhaut is slightly off-centre and closer to the southern side of the belt, the southern side is warmer and brighter than the northern side. Both the narrowness and asymmetry of the belt are thought to be due to the gravity of a possible planet in orbit around the star, as suggested by earlier Hubble Space Telescope images. The Herschel data show that the dust in the belt has the thermal properties of small solid particles, with sizes of only a few millionths of a metre across. But this created a paradox because the Hubble Space Telescope observations suggested solid grains more than ten times larger. Those observations collected starlight scattering off the grains in the belt and showed it to be very faint at Hubble’s visible wavelengths, suggesting that the dust particles are relatively large. But that appears to be incompatible with the temperature of the belt as measured by Herschel in the far-infrared. To resolve the paradox, Dr Acke and colleagues suggest that the dust grains must be large fluffy aggregates, similar to dust particles released from comets in our own Solar System. These would have both the correct thermal and scattering properties. However, this leads to another problem. 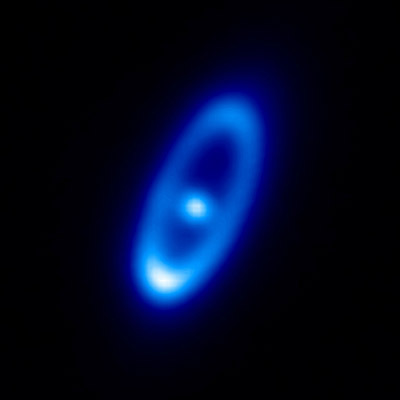 The bright starlight from Fomalhaut should blow small dust particles out of the belt very rapidly, yet such grains appear to remain abundant there. The only way to overcome this contradiction is to resupply the belt through continuous collisions between larger objects in orbit around Fomalhaut, creating new dust. To sustain the belt, the rate of collisions must be impressive: each day, the equivalent of either two 10 km-sized comets or 2000 1 km-sized comets must be completely crushed into small fluffy, dust particles. To keep the collision rate so high, there must be between 260 billion and 83 trillion comets in the belt, depending on their size. Our own Solar System has a similar number of comets in its Oort Cloud, which formed from objects scattered from a disc surrounding the Sun when it was as young as Fomalhaut. “These beautiful Herschel images have provided the crucial information needed to model the nature of the dust belt around Fomalhaut,” says Göran Pilbratt, ESA Herschel Project Scientist.